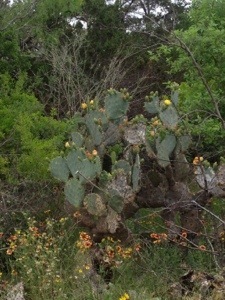 April 27th we visited Government Canyon State Natural Area. This relatively recent addition to the parks system is a combination of so many parks in Texas it’s almost too good to be true. There’s a prairie of wildflowers, canyon trails, lookouts to view the Texas Hill Country, Dinosaur tracks (yes, really), and much more. This is another park that you may encounter an unfriendly creature or two. The visitor from up north somewhere did not find that joke funny. I hope he remembered what she said though. About two miles down the Joe Johnston route you’ll find a trail off to the left that leads to some old ranch buildings. It is rather snakey back in there so go at your own risk. When you make it back to the path continue on down the trail, but keep an eye out for a relatively unused trail off to the other side of the trail. This path takes you down to a creek bed with some nice picture opportunities. It was difficult to capture in the picture, but a lot of the vegetation is growing with the flow of the creek. Obviously this creek bed fills up with any rain so be careful and mindful of the weather on the day of your visit. Keep going past Twin Oaks trail and Caroline’s loop and you’ll make it to the bottom of the bluff. 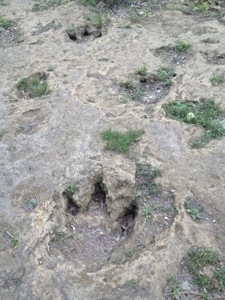 Here you’ll find many picture opportunities including dinosaur tracks. Continue on the trail up the hill and before you get to the Zizelmann Homestead you’ll see quite an amazing site. 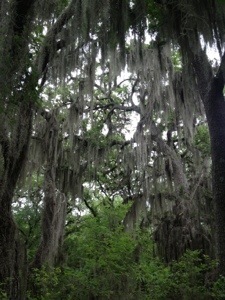 Right in the middle of the park is a naturally occurring Spanish Moss growth that just takes your breath away. Continue up the trail and you’ll see the Zizelmann House. There’s not much to see as they’ve protected the house like it was some fossilized dinosaur…oh never mind. Wait. Let me me stop you here. Don’t risk it. It’s really not worth it. There are some springs at the bottom of the hill. You can’t see the spring though. You just see a nasty, still pool of water with bees (yes…again) and very little else. The spring is a sensitive area and you can’t/shouldn’t explore it too much. Again, take my word for it. It’s not worth a twisted/broken ankle. This is the best picture I could get of it. If you really want to see a nice spring flowing in a state park check out Pedernales Fall State Park and the Wolf Mountain Trail there. Continue on up the trail and you’ll get to the top of the bluff. At the bottom of this is the dinosaur tracks. Take my word for it. Don’t look over the edge. Because of the angle, you have to actually lean out over the cliff to see the tracks. Just trust me, again, and know that they’re there. Continue on Overlook trail until you get back to Joe Johnston Trail. Then you can head on back to the headquarters and parking. There’s no water along the trail and you can get lost if you’re not careful. We had a signal for most of the hike, but we were told of a story by the ranger that explained how important water can be. They recently had to send out a search party for a man who got away from his group and was lost for over 4 hours. There’s over 12,000 acres at this park and it’s easy to get turned around if you venture off the trail. Another important reminder of this park is that sections of the park are only open for parts of the year. 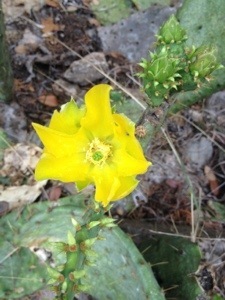 The Protected Habitat area is only open from September to February. I’ll definitely be back here in September as there were pictures of caves, caverns, sinkholes, creeks, and more back at the headquarters. Maybe I’ll see you there. And yes, that’s dinosaur tracks.